Is your Cadet ready to accept the #75for75Challenge? Cadets all around the nation, just like your son or daughter, will be stepping up and raising much needed funds to support their local units. This should provide opportunities for each unit’s cadet program to continue to grow. What is the #75for75Challenge? It’s Civil Air Patrol’s first ever national fundraising campaign that is CADET driven from the ground up. It will generate much needed funds directly to your cadet’s local CAP unit. Any cadet can take the Challenge and thereby take ownership of their program and affect real change for their local unit. The money raised can be used by their unit for projects, equipment, scholarships, or any other needs their unit may have. Once your Cadet embarks on this Challenge they will be able to sign up with their own Personal Fundraising Page by using their EMAIL address (this is the email address that CAP has on file) as their Login Name. They can personalize their page with text, photos and even set a personal fundraising goal. This personal site is where you can send people and businesses in your community to donate to their fundraising efforts. Your cadet can also challenge their friends and other Senior Members on social media with the hashtag #75for75Challenge. Oh, and did we mention there are some amazing prizes available for them too? To participate in the #75for75Challenge, cadets under the age of 18 will be required to have one of their parent’s permission to participate. The 75 for 75 website will give you and your cadet instructions on how to accomplish this. Head over to the https://cap75for75.org/moreinformation/ to learn more about the #75for75Challenge and how your cadet could win big while supporting their local Cadet Program. Should you have any questions about the #75for75Challenge send an email to 75challenge@gocivilairpatrol.org. We All Wish Your Cadet Good Luck! Thank you for supporting our cadets! I got it at 1842 MDT. Stand by, yours is coming. I just got mine in the last hour. Was sent to Commanders on the 22nd, was supposed to go to cadets, parents, and seniors this week (looks like it is). CEAP and VG vouchers, there's more money in the system then ever. the RRO directorate, not PA, because visibility is useless without the ability to execute. I have commented that National needs to get involved in Recruiting. The usual response is units need to do more recruiting and National will not know what units need. No one has asked for more info and has walked away when I tried to explain. It is true National will not know what a particular unit needs. They do not need to. National's role would be to make the public aware of CAP. Wings and units would then be able to take this awareness and provide local information. When the first 20 secs of your 30 sec elevator speech is spent explaining what CAP is in general, you've lost the battle. Are you ready to accept Civil Air Patrol’s Cadet Program #75for75Challenge? You didn’t think this was for Cadets only did you? Cadets and Senior Members from all around the nation will be stepping up and raising much needed funds to support their local units and provide opportunities for their units to continue to grow. What is the #75for75Challenge? It’s Civil Air Patrol’s first ever national fundraising campaign that is CADET driven from the ground up. It will generate much needed funds directly to local CAP units. Senior Members and cadets can take the Challenge and take ownership of their program and affect real change for their local unit. The money raised can be used by each unit for projects, equipment, scholarships, or any other needs the unit may have. If you’ve been involved in Cadet Programs, were once a cadet or simply know the importance of having our future leaders supported, then you will see why Civil Air Patrol is challenging you as well! Once you embark on this Challenge you will be able to sign up with your own Personal Fundraising Page by using your [redacted at poster's request] address email as your Login Name. Your page is the place that you can send people and businesses in your community that want to donate to your efforts. Add your photo, tell supporters about your goals and watch your hard work pay off. Don’t forget to challenge your friends on social media with the hashtag #75for75Challenge. Head over to CAP75for75.org to learn more about the #75for75Challenge and how you support your local unit. Yeah, a little notice would have been nice. I believe it’s coming closer to the BEGINNING of the 75th year. If I remember correctly (and I’ve no doubt that I will be corrected if not), the CAP cadet program started around October 1942. I don't know, it seems a little tone deaf to do this and at the END of the 75th year. In case it wasn't clear, this is the "75th cadet year", the 75-year anniversary of the cadet program. You are correct that the CAP founding year was 1941, and thus its 75-year anniversary was in 2016. It did come in at 2139 ET. Not sure I understand what you are saying here, but that is OK. If October 1942 is the birthday of the cadet program, then the 75th year was between October 2016 and October 2017. (Your first year is between birth and your 1st birthday, and on that birthday you start your second year.) But I guess I will blame it on the disagreement if 2000 or 2001 was the start of the new millennia. Sorry for the digression, just explaining what I was saying. tends to get flagged a lot. So basically Hdqs is setting up thousands of gofundme type pages, each with a photo of a cute puppy (Cadet). But yes, it will generate a lot. Because each Cadet and and their parents will SHARE the page on their Facebook and other social media pages to insure that all their friends and family see the page and are guilted into contributing. The most succesful Cadet fundraisers will be the ones that leverage social media to the hilt and get thousands of views to their donation page. Would be VERY interesting to see all the server stats on this, once completed. I like the concept. Most of the funds raised benefit the local unit, NHQ gets a slice, and everyone wins. The implementation and messaging will be key, and we don't always do a great job with that. If even five cadets in your squadron complete the challenge, you get $300+ in your unit bank account. For small squadrons, that's a lot of cabbage. If just half my cadets get to $75, we'll be floating in the fat #75for75Challenge cash. 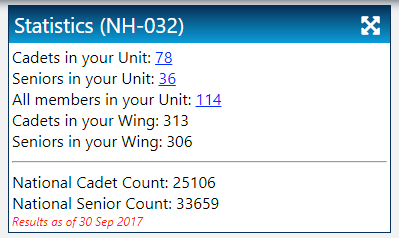 Any requirements for Squadrons to report how they spend this big influx? I'm sure CAPR 173-1 governs. Don't go taking any Caribbean vacations with the squadron credit card, or buying a car. Other than the obvious like you state ... Virtually nothing in that doc that dictates how a Squadron can spend its money. Scholarships for Cadets, uniforms, training gear, etc., etc. I'm assuming can be decided on locally. How big an item has to be run up a chain first? If a Squadron got a $4k donation and wanted to build up a nice simulator for Cadets, for example, can they 'just do it' or would that have to go up through channels? If the cost exceeds $500, the unit's Finance Committee would need to approve it before starting, but nothing higher. When the receipts are due, the unit would need to include a copy of the FMC minutes approving the expenditure AND a copy of minutes approving the payment of the bills. I agree with the OP, this comes at a bad time, at least in our unit. We were in the middle of the Wreaths Across America Fundraiser. $75 is a hefty donation to ask for as well. FWIW, we had six cadets stand in front of Trader Joe’s on Veterans Day for 2 hours and collect $1705. That’s 113 veterans honored and $565 back to the unit, again, in just those two hours alone.